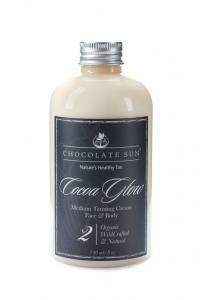 Chocolate Sun calls itself "Nature's Healthy Tan." Self tanning takes a little practice, and I was looking for a new one that was foolproof. The products were given free to sample, but all opinions are the author's own. Chocolate Sun All Natural Sunless Tanning products, like all sunless tanners, contain DHA (dihydroxyacetone) as the active ingredient to promote self tanning. However, what sets them apart are the additions of the various botanical and herbal ingredients to help keep skin soft and smooth. The tanning creams and gel contain various organic and Ecocert certified ingredients, too. As the name suggests, there is a chocolate scent to the tanning products. I received the Cocoa Glow cream (medium to dark skin tones) and Cocoa Illume Lite (fair to medium skin) for the face. Prior to using the sunless tanners, I used a body scrub to help remove dead skin. You may want to apply a moisturizer or barrier cream to nails, palms, between fingers/toes, and other dry areas so the tan applies evenly. The first time I used the Cocoa Glow cream, I used a small amount to ensure that the product tanned evenly and with a natural look. It did take a little time to rub the product in, but this helped ensure that I applied it evenly. This light touch gave me a faint glow. However, I applied it the next night and achieved a great sun-kissed look that was at least two shades deeper. The scent was almost delicious! My skin felt smooth and supple after its use and the tan developed overnight while I slept. It faded nicely over five days and didn't turn orange. The facial gel was lightweight and did not make me break out, which I appreciated. Again, I used a light touch the first application and a heavier one the second. My face has a ruddy complexion from the start, however, so changes were more subtle. I appreciated this because I didn't need to swap out my foundation; instead, I just added a bronzer and everything blended well. InStyle named Chocolate Sun one of the Best Natural Self Tanners in 2016. According to press information sent with the products, the products have been featured in Wonder Woman and Fifty Shades of Grey among other movie and television programs. The sunless tanning products range from $34 to $42 and can be purchased online or at various locations across the U.S. and world. You can also visit their studio in Santa Monica, CA, for a personal tanning session. No matter how you purchase the tanners, you should achieve a lovely chocolate glow!